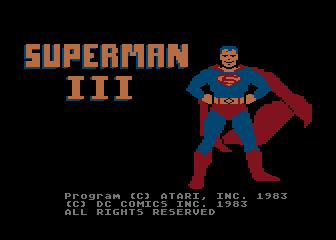 The plot for the game revolves around Superman's fight with the super computer at the end of the movie. But what about that cool game Ross played in the movie you ask? 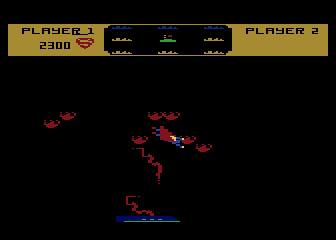 As it turns out the 'game' was nothing more than an elaborate computer sequence designed by Atari specifically for the movie. The actual game that was developed didn't have to do with this sequence. 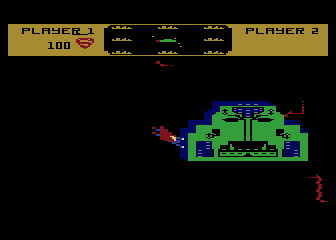 This was because it would have been impossible to do anything like it on the Atari 8-bit computer (same deal as with the Last Starfighter game). 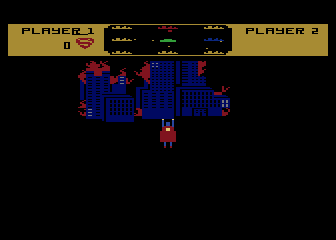 As mentioned before, the game revolves around Superman's fight with the super computer. 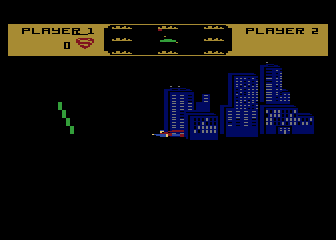 The game board is separated into eight city blocks with the super computer in the center. You play the role of Superman (naturally) who must fly around the screen destroying energy pulses being sent out by the computer with his heat vision. These energy pulses will roam the screen in a random pattern, often snaking around for a few moments before actually hitting a city. If a pulse hits a city it will immediately be drained of all its power and will go dead (all the lights will go out). Once a city is dead, if a probe hits it again it will catch fire which Superman will have to put out with his ice breath. If a fire burns too long the city will turn to rubble and be permanently destroyed. Hitting the pulses is very difficult due to the fact that Superman is always moving, and it's really easy to overshoot your target. The computer will also shoot out green Kryptonite probes which will disable Superman for a few moments (afterall, you can't really kill the man of steel). Also keep an eye out for people that randomly appear during the later rounds whom Superman can grab for extra points. The whole game plays somewhat like Missile Command in the round, but doesn't have the same addictive fast paced gameplay. If the game has one flaw (other than being slightly slow paced), it's the controls. Superman is simply too difficult to control! 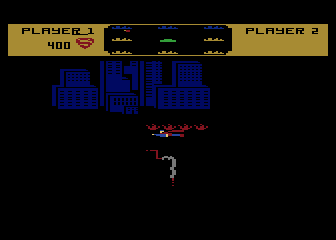 Superman is always moving forward, and the player must direct him using the joystick by pressing left and right to change the direction he's moving. Although you can control Superman's speed by pressing up and down, he always seems to be moving too fast. And while the board is rather large, it seems too small for the fast flying Superman (I guess that's the price you pay for moving faster than a speeding bullet). Fine tuning the controls would have greatly increased the the games playability. So why did Superman III go unreleased? It was determined that after playtesting by focus groups that the game was not a strong enough candidate for release (ie. good, but not good enough). Not surprisingly the focus groups cited the difficult controls as their main complaint. 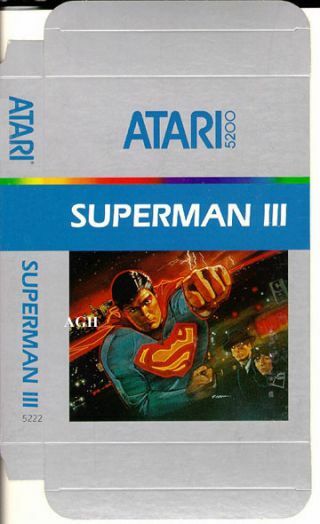 Although a prototype 5200 box has been found, there is no evidence to suggest that Superman III was ever planned for the 5200. In fact the part number (CX-5222) was actually assigned to Jungle Hunt. This may have been due to a miscommunication with the art department. BTW if the title music sounds familiar it's because it was later reused for The Final Legacy (Brad Fuller also did the audio for that game as well).